Home / Region / Baton Rouge / LAFM TV 11th Season Kicks Off Today! 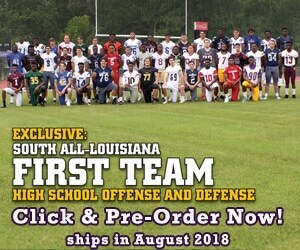 Our 11th season of Louisiana Football T.V. Magazine starts this week! Check your area below and check us out. We have former NFL quarterback Bubby Brister on the show as well as WGSO executive producer Ken Trahan and longtime NFL offensive lineman Ralph Tamm. Also, We will have a call in from North DeSoto Head Coach Scott Abernathy so check us out on LA football T.V. Magazine.